Edraw provides some interactive area graph charting symbols that offer advanced features yet is simple to use. An area chart is a line chart where the area between the line and the axis are shaded with colors. These charts are typically used to represent cumulated totals over time and are the conventional way to display stacked lines. 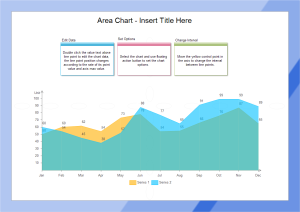 Various templates and examples help you quickly build area charts in minutes with drag-and-drop functionality. Compared with other software, it is a good buy for both beginners and professionals. We assure you this will be great worth for your money with free maintenance and upgrade service forever. Every time you open the Area Chart Example, the first thing that comes into eyes is the guide of "how to use Line/Area/Scatter". Additionally, every time you move the cursor over an icon of example or shape, it will automatically shows you how to apply it, which is extraordinarily thoughtful and time-saving. That means you don't have to spend tons of time to find out how to use the application. You may feel like you are following a considerate guide in a relaxing tour. Plus, the link of User Manual is also added in the guide. You can search for more detailed help directly within the drawing page. That is fabulous. With the interactive functionality of hyperlink, you are sure to deeply amaze and impress your leader or other audience. Can you believe that you can even open another application within this program with only 1 click? It is true. By linking web pages, attachments, notes or other files, you can navigate back and forth with great ease and show all you have got even within only one page. Such powerful one-stop solution is definitely a must for you. You won't regret to have it. Its flexibility lies in the generic graphic format support, which allows users to import Visio XML files perfectly. It can be integrated with Microsoft Office easily and seamlessly. The MS Office-like UI is easy to learn and use.Users familiar with MS Office will become familiar with Edraw soon. The first way to set chart data is loading data from file. You can copy the example text included in the User Guide to newly created text (.txt) file, save the source data, select a Line/Area/Scatter chart shape, click floating menu Load Data from File to load the text file. Area charts are much like line charts, but they display different colors in the areas below the lines. With lots of pre-drawn area chart examples and more than 6000 symbols, charting couldn't be easier! 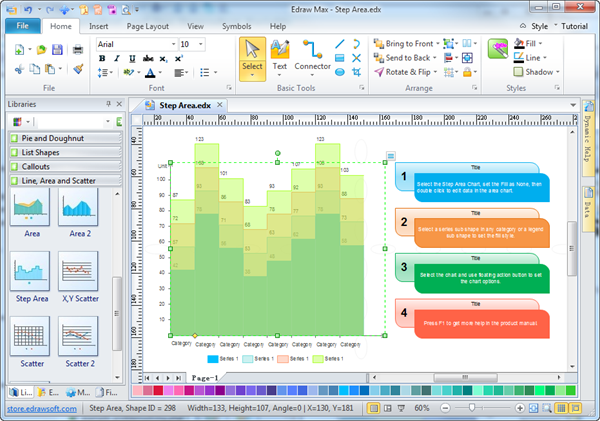 Edraw is easy to design simple line graph, area graph, step area graph and more. Area chart emphasizes the magnitude of change over time. Line area displays the trend of values over time or categories. 3D line area is available with a 3-D visual effect. Stacked area displays the trend of the contribution of each value over time or categories. 100% stacked area displays the trend of the percentage each value contributes over time or categories. Step area is useful for displaying changing numeric values over a period of time.